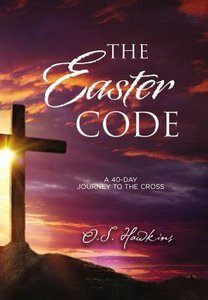 The Easter Code, by bestselling author O. S. Hawkins, is a meaningful devotional booklet for the Lent season. This $2.99 value is an ideal gift to purchase in bulk for friends and family, pastoral staff, Bible study groups, and church congregations. Each day includes Scripture, a devotion, a Code Word to think on and make the message memorable, and a prayer. Spend meaningful time with Jesus this Lenten season as you read through 40 days of devotions. The Easter Code offers a seasonal devotion for each day from Ash Wednesday to Easter. At only $2.99, The Easter Code will serve as an excellent self-purchase or outreach gift. Every day, you'll read an important Code Word to think on during the season. This unique element will create a profound experience as you prepare your heart and mind for the Easter Sunday. Follow the journey of Christ through the places, people, and events in His life all the way to His resurrection. The Easter Code is a meaningful way to celebrate and share God's love at Easter. The author royalties from the book are donated to Mission:Dignity, a ministry that helps men and women who have faithfully served God's people for modest pay retire with well-deserved dignity, independence, and often the ability to continue serving. About "The Easter Code Booklet: A 40-Day Journey to the Cross"